Bangalore: Facing criticism for hopping between hospitals since his arrest, former Karnataka chief minister B.S. Yeddyurappa on Wednesday moved back to his cell in Bangalore’s central prison. O.S. Chidappa, dean of the Victorial Hospital, where the Bharatiya Janata Party (BJP) leader had been admitted, said Yeddyurappa asked to be taken back and treated in jail when doctors visited him. 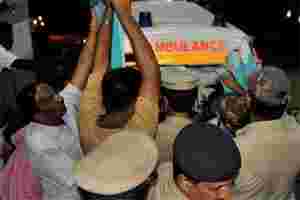 Policemen spread a bed sheet on the ambulance to cover up former Karnataka chief minister B S Yeduyurappa from Media persons as they shift former CM in the Victoria hospital in Bangalore on Tuesday. PTI. Yeddyurappa has been allotted an air-conditioned cell in a newly opened block of the prison. On Tuesday, after being discharged from Sri Jayadeva Institute of Cardiovascular Sciences and Research, Yeddyurappa made an exit from the back gate, from where he was taken to Victoria Hospital. Policemen were seen creating a screen using green bedsheets to shield him from photographers as he entered the hospital. Jayadeva hospital had discharged him after saying his condition was stable. Hospital director C.N. Manjunath on Tuesday said Yeddyurappa’s heart condition was stable, but he needed treatment for back ache, frequent urination, diabetes, hypertension, hypothyroidism, plaque deposits in coronary arteries, and Parkinson’s disease. The former chief minister was arrested on Saturday after an arrest warrant was issued by a special Lokayukta (ombudsman) court while hearing a private complaint filed by a city-based lawyer. He was remanded to judicial custody until 22 October in two of five cases of corruption and illegal land deals filed by two Bangalore advocates in January 2011. According to the complaint, Yeddyurappa is alleged to have taken several decisions related to land ownership in and around Bangalore in return for favours to family-owned firms. A few hours after entering the central jail premises on Saturday, he complained of chest pain and was shifted to Jayadeva hospital in the early hours of Sunday. Yeddyurappa also received a series of visitors including chief minister D.V. Sadananda Gowda and several cabinet ministers. Yeddyurappa’s bail plea is scheduled to be heard at the high court on Thursday, along with that of former housing minister S.N. Krishnaiah Setty, who was also arrested with him.